VRINDAVAN, India October 13, 2017: a family of Krishna devotees sing on kirtan street and sell Holy literature, Vrindavan is considered a Holy place. SALUNKWADI, INDIA - November 26, 2015: A narration given by man with music called KIRTAN, in rural village Salunkwadi, Ambajogai, Beed, Maharashtra, India, South East Asia. Closeup of an Indian barrel-shaped two-headed drum called Pakhavaj in KIRTAN, rural village Salunkwadi, Ambajogai, Beed, Maharashtra, India, South East Asia. SALUNKWADI, INDIA - November 26, 2015: Closeup of harmonium artist in KIRTAN, rural village Salunkwadi, Ambajogai, Beed, Maharashtra, India, South East Asia. SALUNKWADI, INDIA - August 11, 2016: Supporters in a narration given by Patil Maharaj with music called KIRTAN rural village Salunkwadi, Ambajogai, Beed, Maharashtra, India, South East Asia. A man preparing pakhavaj one of the Indian Music instrument for Kirtan in rural village Salunkwadi, Ambajogai, Beed, Maharashtra, India, South East Asia. SALUNKWADI, INDIA - November 15, 2016: A narration given by man with music called KIRTAN rural village Salunkwadi, Ambajogai, Beed, Maharashtra, India, South East Asia. Young beautiful girl in a Sari standing in the Krishna temple and takes on the mobile phone as the devotees sing the kirtan of hare Krishna. 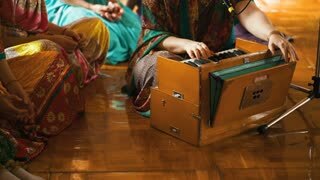 The performance of the kirtan of the hare Krishna in the Krishna temple on the ancient classical instruments. Big game plan the harmonium.